Cell Messenger 1.1.151 free download. Cell Messenger lets you send, receive and archive SMS messages from your mobile phone. Cell Messenger lets you send, receive and archive SMS messages from your mobile phone. Cell Messenger is a software that allows you recive SMS messages. It provides support for reading your mobile's phonebook, sending group messages, anti-spam SMS filtering, unicode and multipart SMS messages. SMS Reception Center - you can easily set up SMS to e-mail gateway, SMS chat, conference, newsgroup and any other messaging service. TWO-WAY messaging! Send and RECEIVE textmessages (SMS) on your PC. SMS-it is a software that allows you to send SMS to mobile phones through your computer. G-Messenger is the peer-to-peer communication solution allowing you to send messages and files to anyone on your local network or broadcast to a group. Fully featured Alphanumeric Paging Software with Air Messenger Client Support. SMS Create Pro is a tool for sending text messages from a PC to mobile phones using Email service. Mail2SMSXXL application will enable you to use your favorite e-mail program to organize your SMS messages on your mobile phone. Send SMS text messages to cell phones. SIMSOR Desktop allows you to send SMS messages and any files to mobile phones and save images as wallpapers. PC-Telephone is a useful and powerful communication utility that allows you to exploit the full communication potential of the Internet, Integrated Services Digital Network (ISDN) and Public Switched Telephone Network (PSTN). SMS2SMS is a Desktop application to send bulk sms and mass sms to almost all gsm network around the world. A small utility that when coupled to a old Nokia mobile phone will send any incoming sms messages to a default email address. Data updated in your pc or mobile phone is detected automatically and synchronized with the opponent. 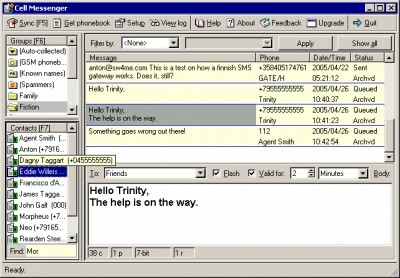 Send numeric and alpha-numeric messages from your PC to pagers and cell phones from the handy Windows application.